The Pratt & Whitney JT3D is an early turbofan aircraft engine derived from the Pratt & Whitney JT3C turbojet. It was first run in 1958 and was first flown in 1959 under a B-45 Tornado test aircraft. Over 8,000 JT3Ds were produced between 1959 and 1985. Most JT3D engines still in service today are used on military aircraft, where the engine is referred to by its USAF designation of TF33. Aware of the competition from the Rolls-Royce Conway turbofan, Pratt & Whitney decided to develop the JT3D turbofan from the JT3C turbojet for later deliveries of the Boeing 707 and the Douglas DC-8, then nearing entry into service. A 2-stage fan replaced the first 3 stages of the 9-stage JT3C LP compressor. On the LP turbine, the second stage was enlarged and a third stage added. Unlike GE with the CJ805-23, Pratt & Whitney had not undertaken any transonic fan research prior to designing the JT3D, so they were unable to incorporate a single stage unit into the specification. Instead P&W designed a 2-stage unit based on some research they had done to support the J91 nuclear turbojet. On the Boeing 707 the JT3D fan nacelle was relatively short, whereas the Douglas DC-8 installation had a full length fan cowl. Pratt & Whitney provided a kit whereby JT3Cs could be converted to the JT3D standard in an overhaul shop. In 1959, important orders for the engine were the Boeing 707-120B and Boeing 720B when American Airlines ordered one 707 powered by JT3D turbofans and KLM ordered a JT3D powered Douglas DC-8. The earlier 707s had been powered by the turbojet JT3C and the improved efficiency of the turbofan soon attracted the airlines. A JT3D powered 707-123B and 720-023B (the suffix B was to indicate a turbofan powered aircraft) entered service with American Airlines on the same day, March 12, 1961. 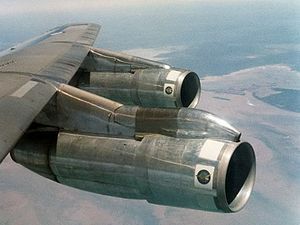 The Boeing KC-135 Stratotankers were all originally powered by turbojet engines. With the demise of many airline 707s the United States Air Force took the opportunity to buy the surplus airframes and use the engines to re-fit the KC-135As used by the Air National Guard and reserve squadrons with the civilian JT3D (designated TF33-PW-102). Over 150 aircraft were modified and the former KC-135A were re-designated the KC-135E. JT3Ds from Boeing 707s are used to re-fit USAF KC-135As, 1984. After long service for both airlines and air forces, the number of JT3D powered aircraft is steadily decreasing. One hundred thirty five KC-135s use the JT3D while 354 were fitted with CFM International CFM56 engines, which provide greater thrust and increased operational flexibility due to their lower noise footprint. The noise of the JT3D is one of the reasons NATO has debated re-fitting their E-3 Sentry AWACS fleet, since the aircraft are subject to restrictions that aircraft with modern engines are not. Operational flexibility would be further increased due to the ability of higher power engines to increase the ceiling of the aircraft, extending the horizon for radar surveillance; for instance, RAF, French and Saudi E-3s routinely fly higher than NATO/USAF counterparts. In 1961, the TF33 powered Boeing B-52H Stratofortress entered service. The "H" model of the B-52 was the only production variant of the heavy bomber to be fitted with turbofan engines, and is the only model remaining in United States Air Force service. It is expected to remain as a mainstay of the Air Force heavy bomber fleet until at least 2040, although options for replacing the 8 TF33 engines with more modern equivalents are being considered. ^ a b c d e f g h i Taylor, John W.R. FRHistS. ARAeS (1962). Jane's All the World's Aircraft 1962-63. London: Sampson, Low, Marston & Co Ltd.
^ "Military Turbofan Engine Data". www.aircraftenginedesign.com. Retrieved 20 April 2018. Wikimedia Commons has media related to Pratt & Whitney TF33.